Protecting Americans since before they were Americans. The United States Marine Corps traces its institutional roots to the Continental Marines of the American Revolutionary War, formed at Tun Tavern in Philadelphia, by a resolution of the Second Continental Congress on 10 November 1775, to raise 2 battalions of Marines. 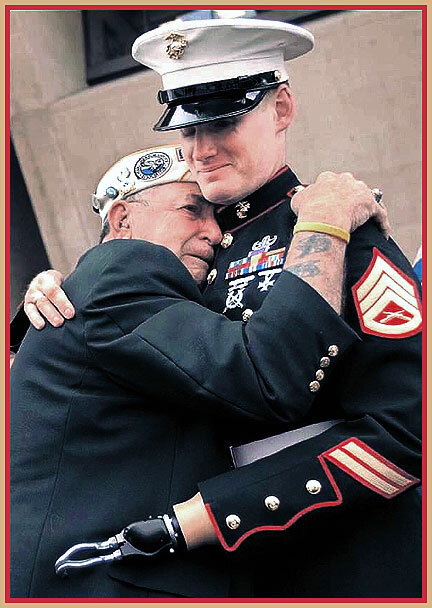 The raw emotion of the this image is so clearly illustrated by the heart felt love of a Marine from one generation for the sacrifice made by a Marine from our generation. Their bond fills me with pride as such men have selflessly given the last full measure to protect the United States of America since the Revolutionary War. I thank you for posting this iconic picture. I thank you for posting this iconic picture. Don’t thank me; thank them.